My grandmother was the mother figure in my life since I can remember and for that I love her dearly. She taught me everything I know: how to cook, how to knit and crochet, life values, to be good and respectful to others, but most importantly, to recycle and upcycle the things I own, thus saving money and saving the planet in the process. And ever since, I've been trying to make her proud with everything I do. Last time I saw her, a few months back, she handed me her skeins of macrame yarn along with a bunch of doilies and lace tablecloths. She knew I will see the beauty and potential in them, what they could be, not what they are, a bunch of old, out of fashion decorations, and I will not throw them away. And she was right. I spoke about the importance of memories and keepsakes in my previous blog post about how to crochet a granny square blanket out of recycle yarn. 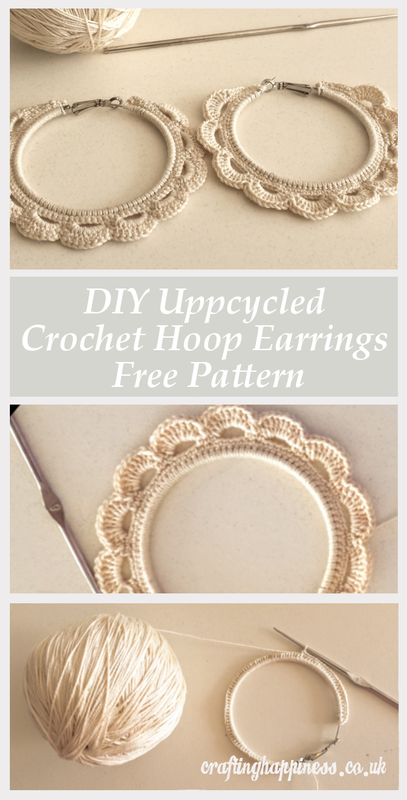 This post is about the same thing, but this time I am making a beautiful pair of crochet hoop earrings out of my grandma's old skein of macrame yarn, a keepsake to remind me of her. Yours doesn't have to be a recycling project. 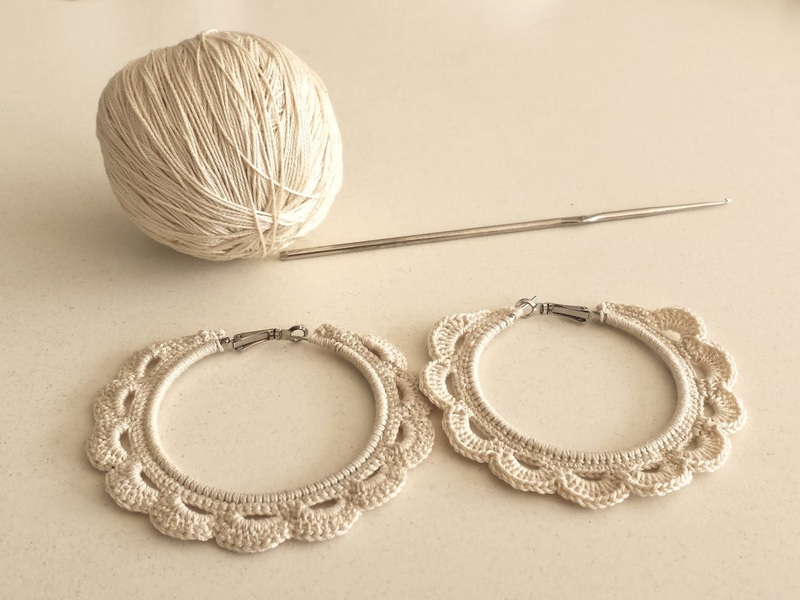 You can use any kind of yarn, doesn't matter, you will still end up with a beautiful pair of earrings that cost you pennies but looks expensive and unique. 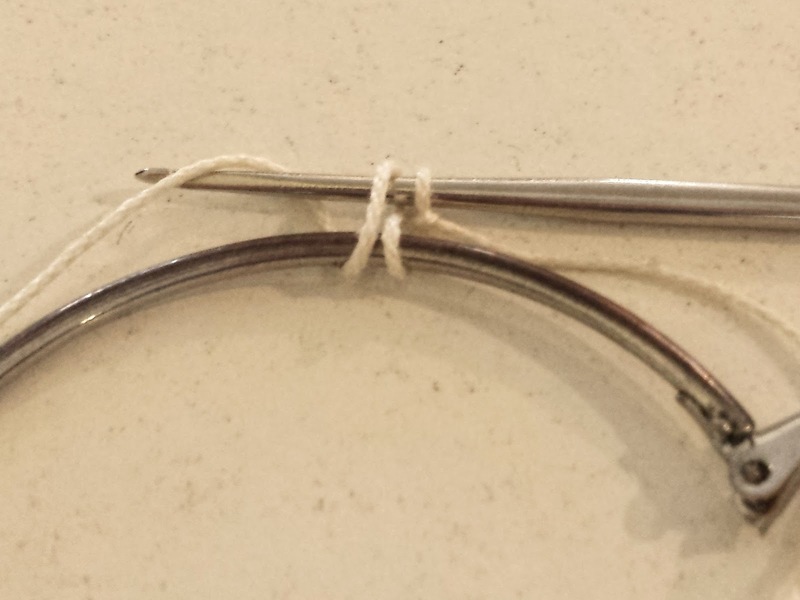 I used an old pair of hoop earrings I had laying around, they were tarnished and I would have never wore them again. Double points for recycling 2 things at once!! 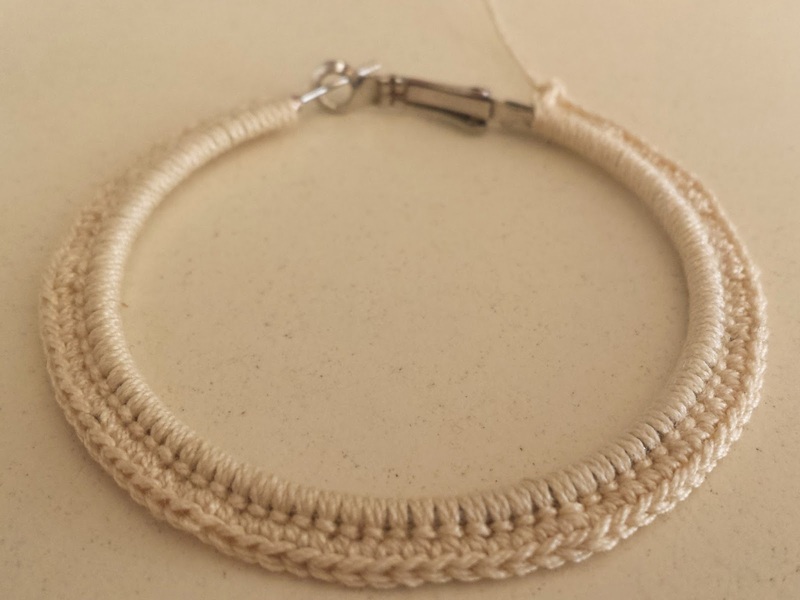 cotton yarn in the colour of your choice, recycled or not. 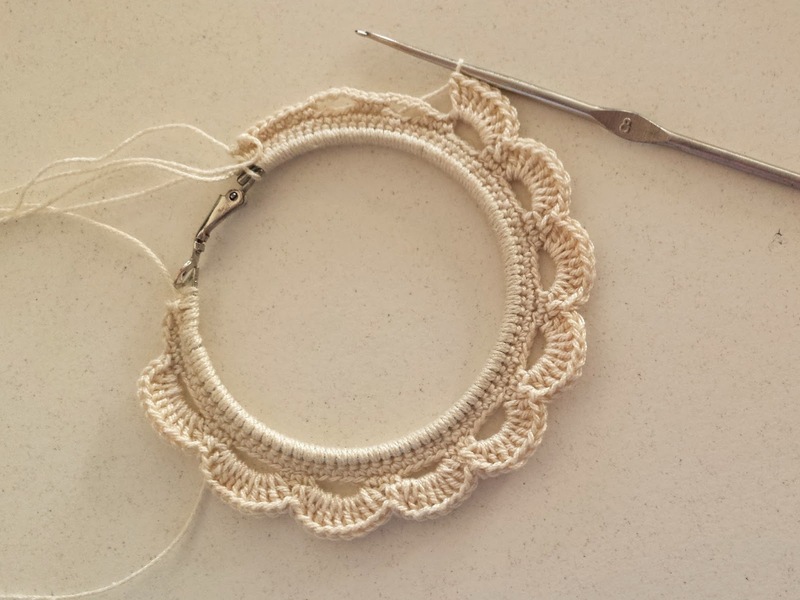 I used cotton yarn used to make doilies back in the day which is quite thin. I don't know the exact size of it as it's so old, but if you were to compare it to something, I would say it is the thickness of a medium size sewing needle. 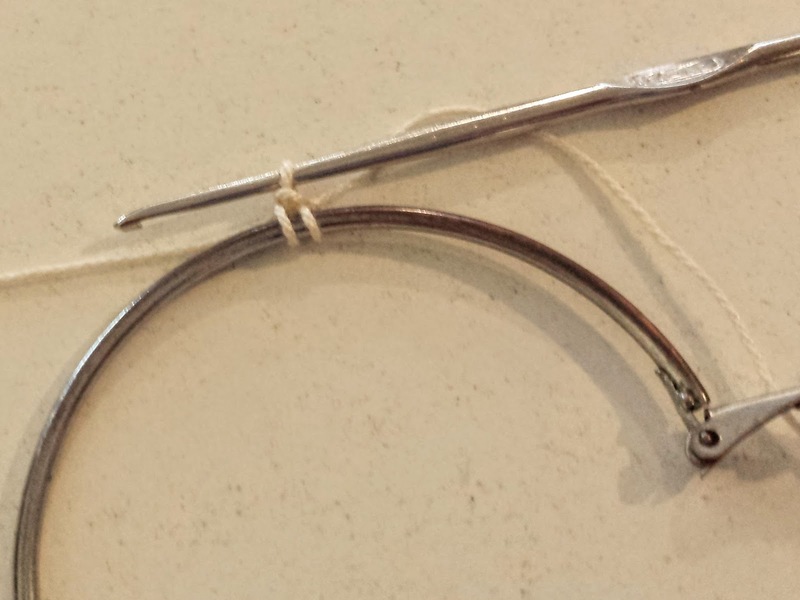 You can also compare it to the crochet hook I used (see the pics) which, as I said, is size 8. I would not recommend a much thicker yarn as it will make the earrings too big. 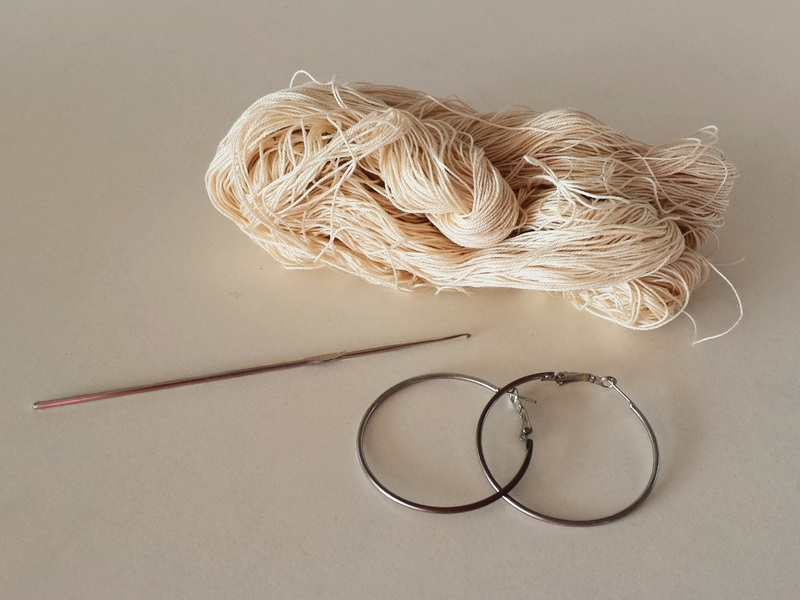 Pair of plain metal hoop earrings, mine are about 6cm in diameter, but any size will do, depends on your taste and how big you want the earrings to be. This is a quick project you could complete in one afternoon. 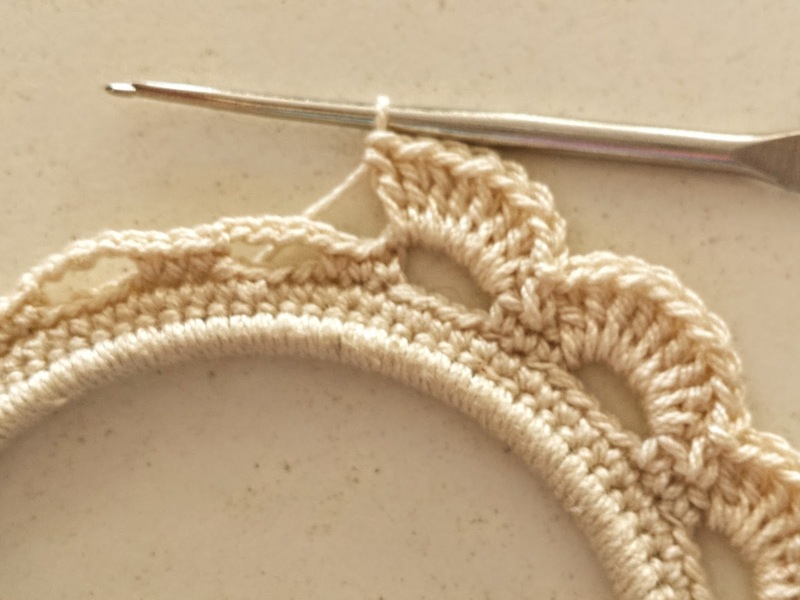 The pattern has only 4 rows and once you got the hang of it, you will finish it in no time. 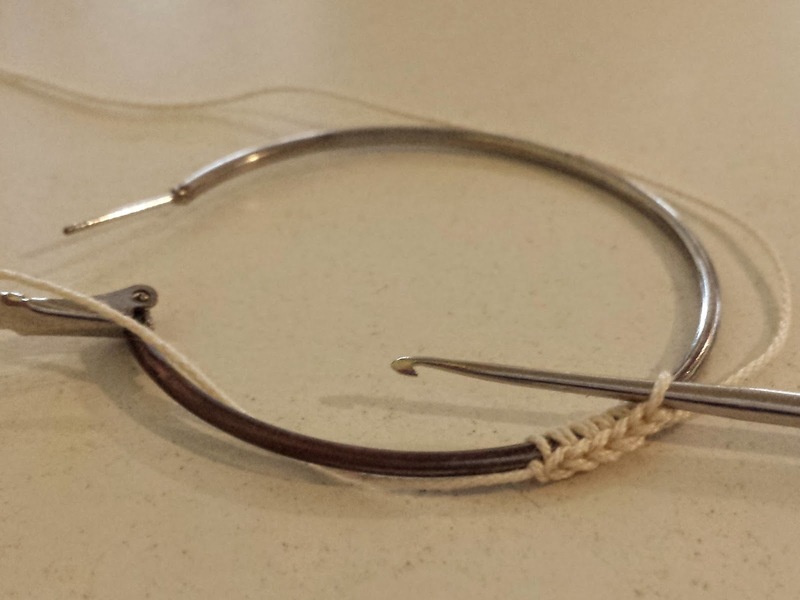 Also the pattern is quite flexible so you can use any kind of medium to thin yarn and any kind of size hoop earrings. 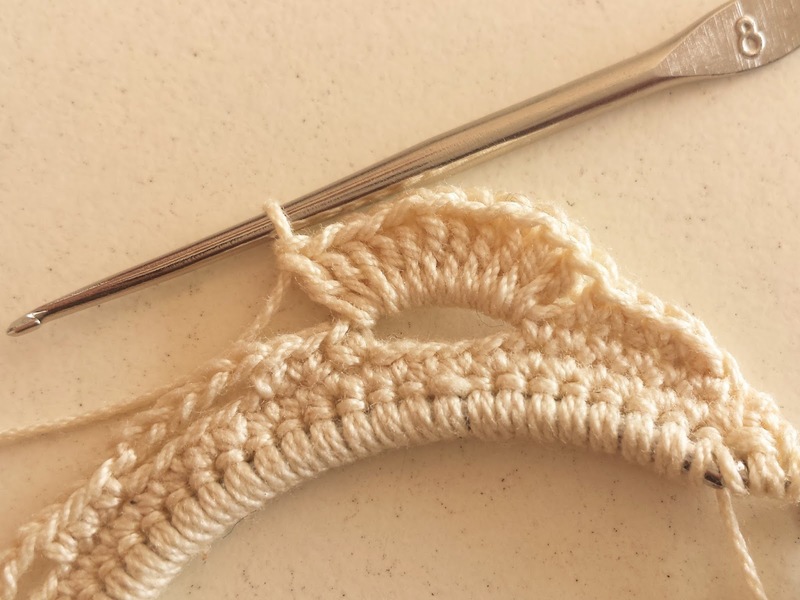 First row is made of single crochet stitches only. 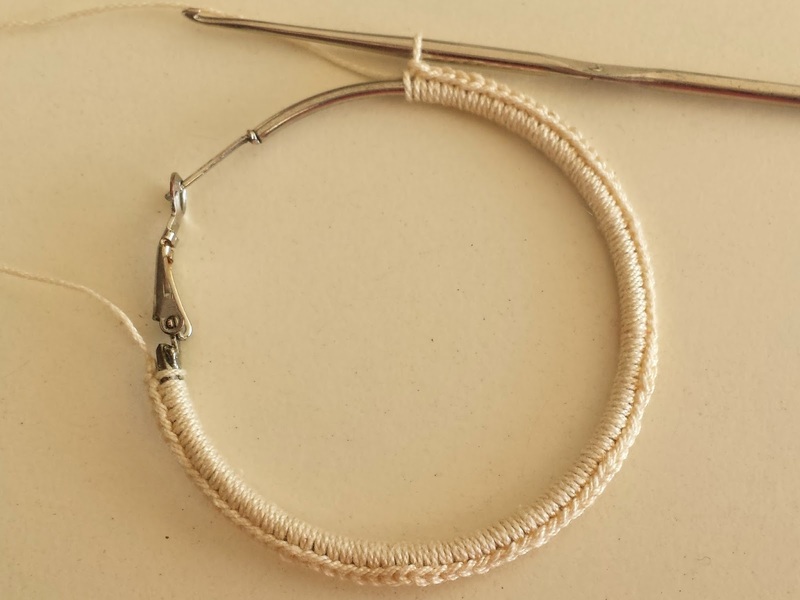 Pull the yarn around the hoop to make a loop (now you have 2 loops on your hook). Yarn over the hook and pull through both loops. Continue until the entire earring is covered in yarn. 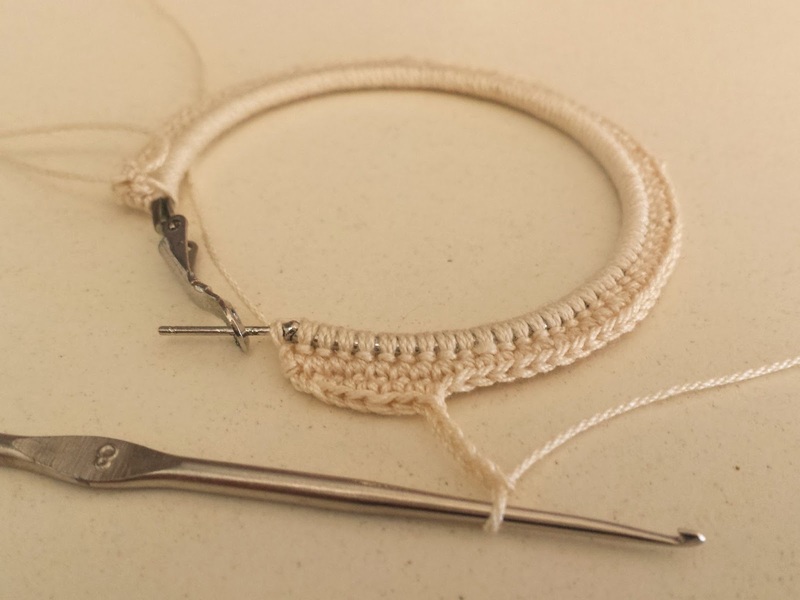 I never counted my single crochet because it did not matter, the pattern is flexible enough to fit. 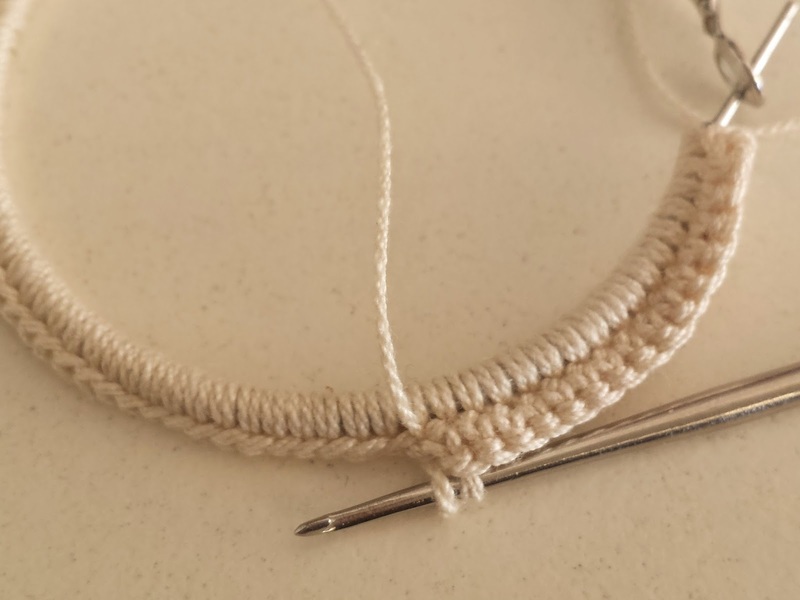 I would recommend you start from the clasp end and not make too many single crochet stitches as the final result will end up wrinkly. 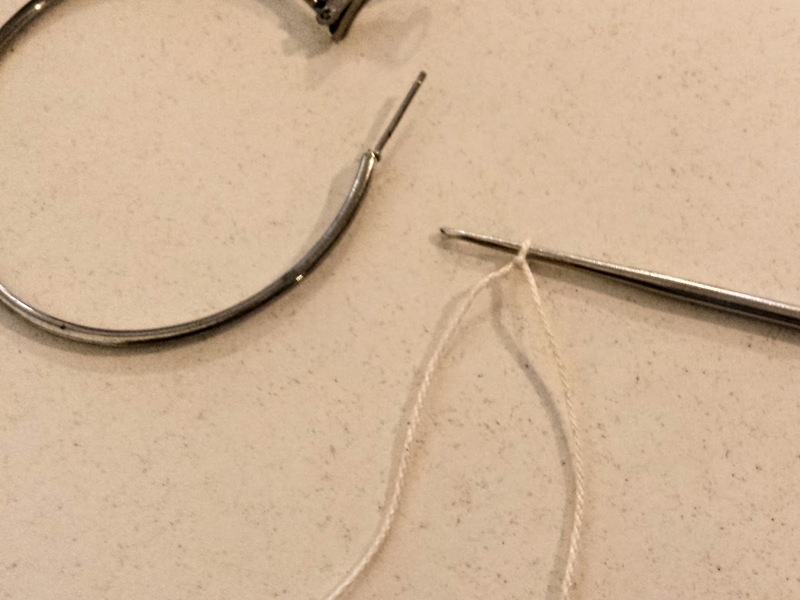 The first row should look evenly spaced, should not show the metal, but not be too tight that the loops will fall at the other end of the earring. Turn around the earring and continue with the second row, without closing the first one. 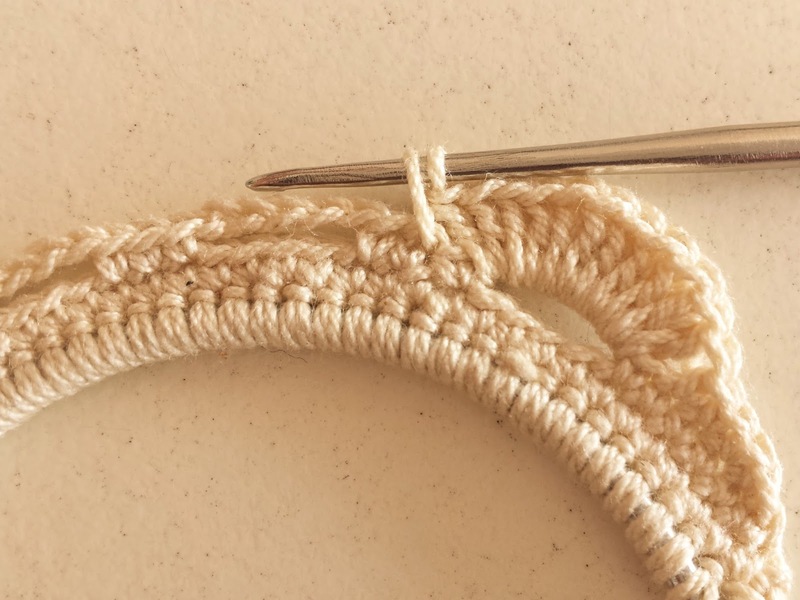 The entire row is made of single crochet stitches, one in each stitch of the first row. This is to create some thickness. This time, close the row and start from the other end (the pin end). We will create the loops that will become the shells. 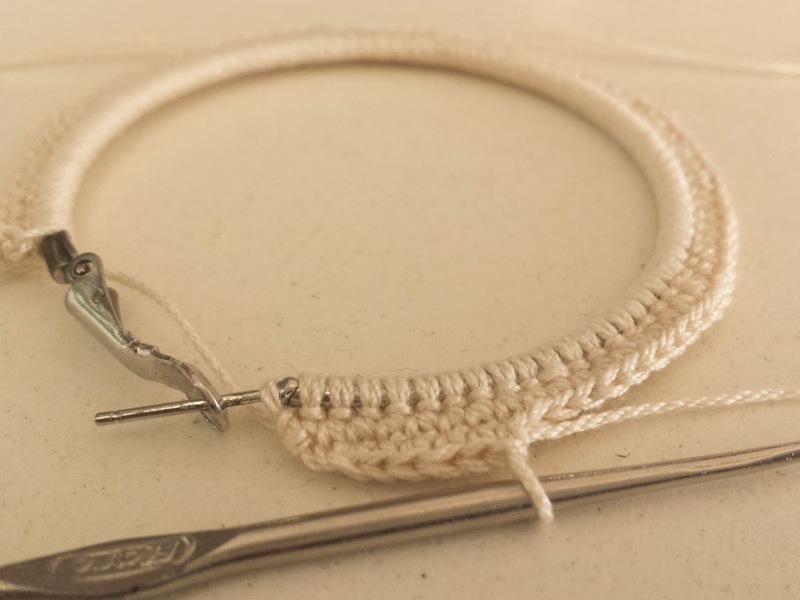 Start with 5 single crochet stitches (if your hoop is smaller than mine, or if the yarn is thicker, do 3). 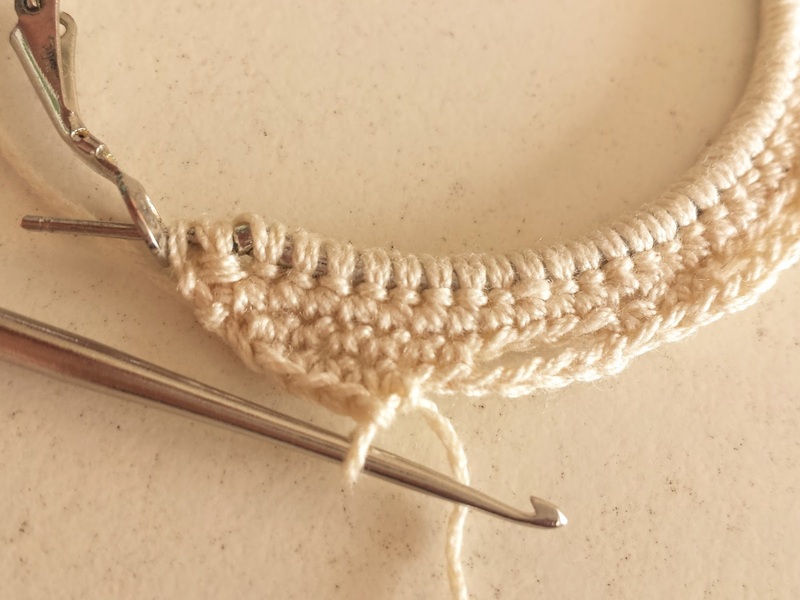 Count 5 stitches and insert your hook in the fifth one pulling a loop, then yarn over the hook and pull it through both loops creating one single crochet. Make 2 more (3 in total). 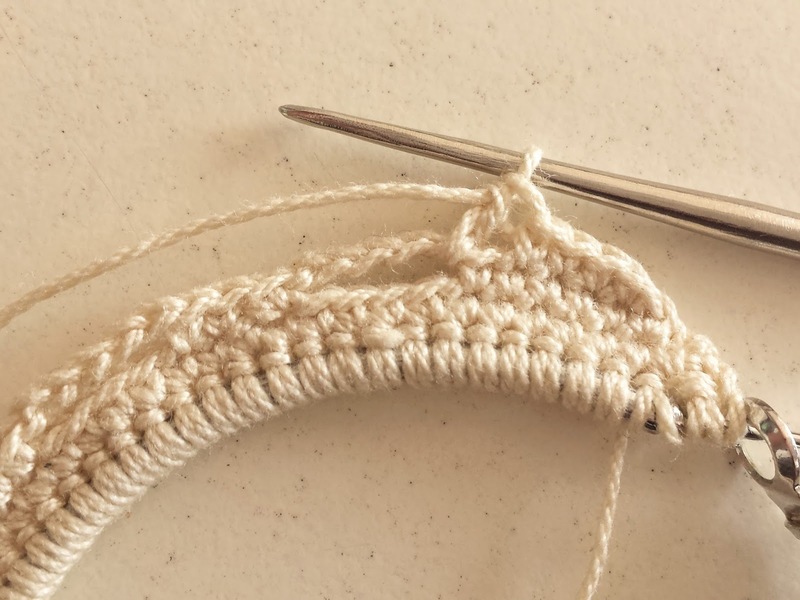 Continue with the pattern until the end of the row: chain 5, skip 5, 3 single crochet, chain 5, skip 5, 3 single crochet and so on, finishing in 5 single crochet stitches. Start the 4th row from the pin end again. 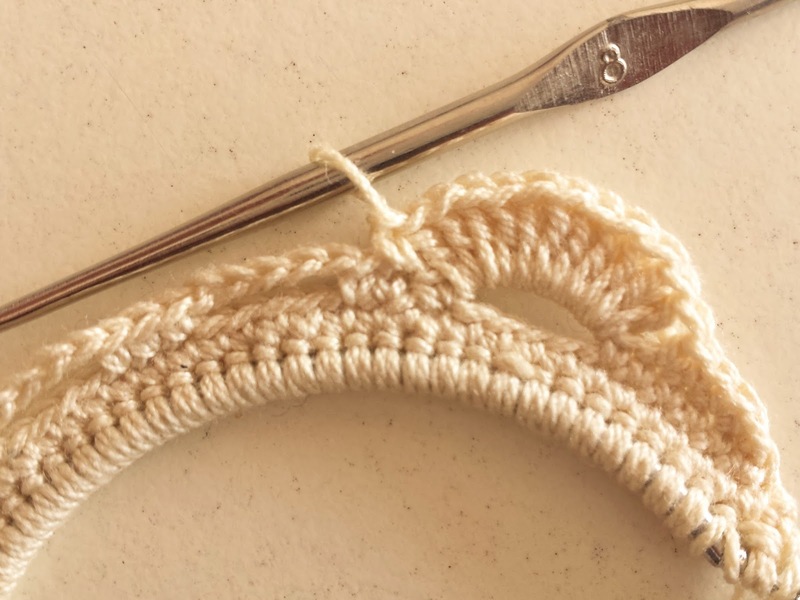 Skip the first stitch then make 3 single crochet stitches. 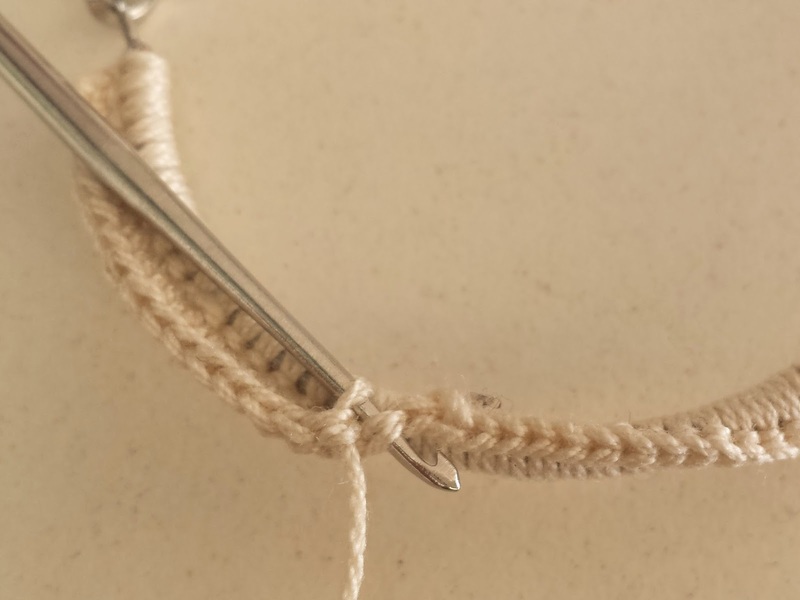 Skip the last stitch and make 10 double crochet stitches inside the 5 chain loop. 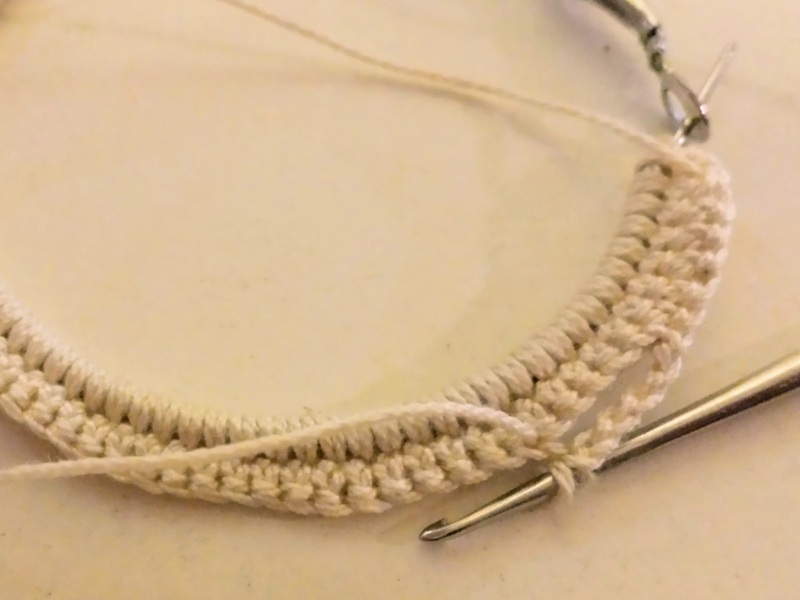 To make a double crochet, yarn over the hook then pull the yarn around the loop (you should have 3 loops now on your hook). 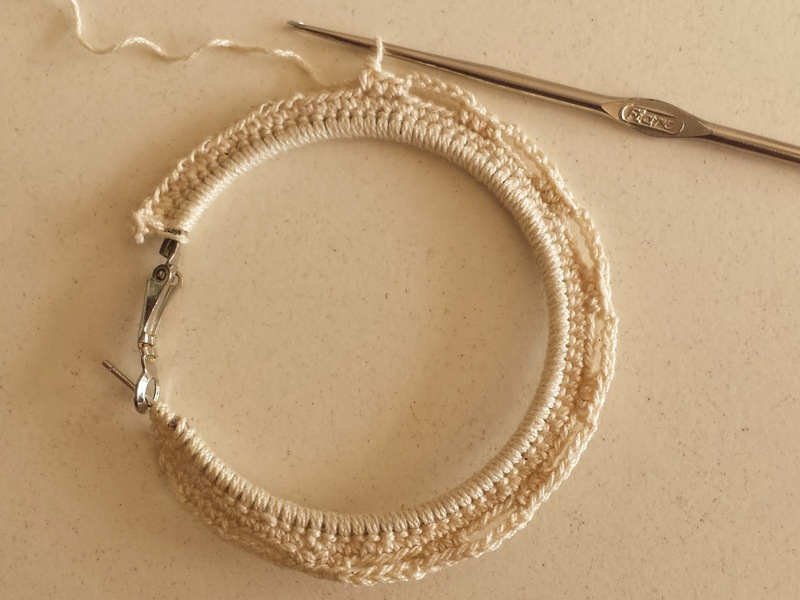 Yarn over and pull it through the first 2 loops (you now have 2 loops left on your hook instead of 3). 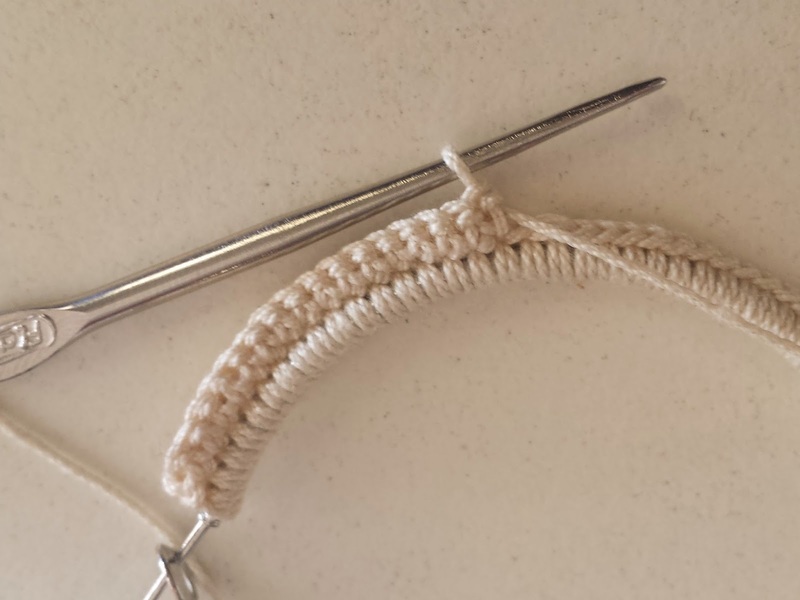 Yarn over again and pull it through the last 2 loops and that is one double crochet stitch. 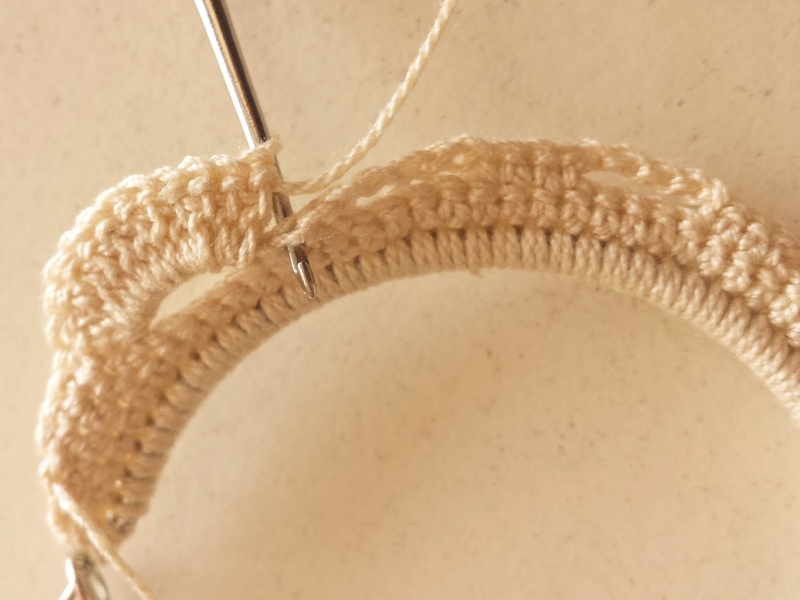 Now make 10 of them in the loop, making sure after each one that you push them close together to form a tight shell shape (also known as scallop stitch). 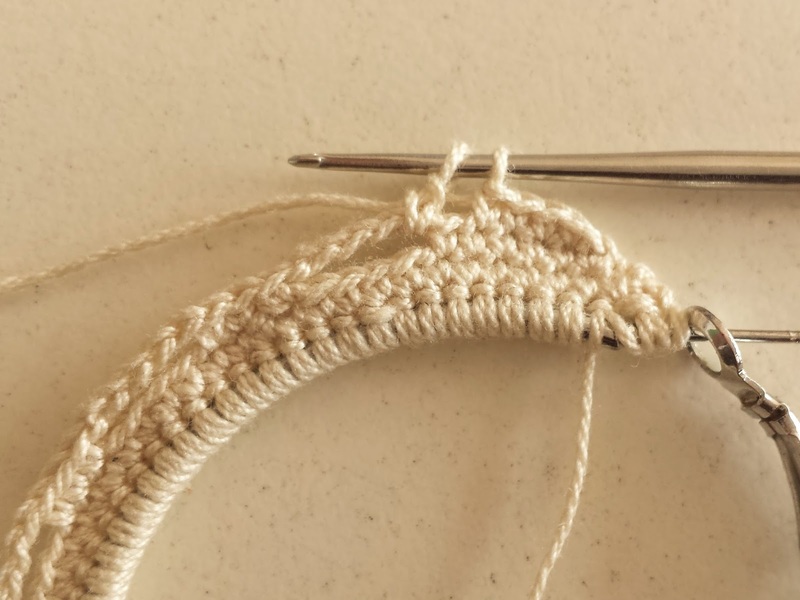 Skip one, make a single crochet stitch in the next stitch, then skip the next one. 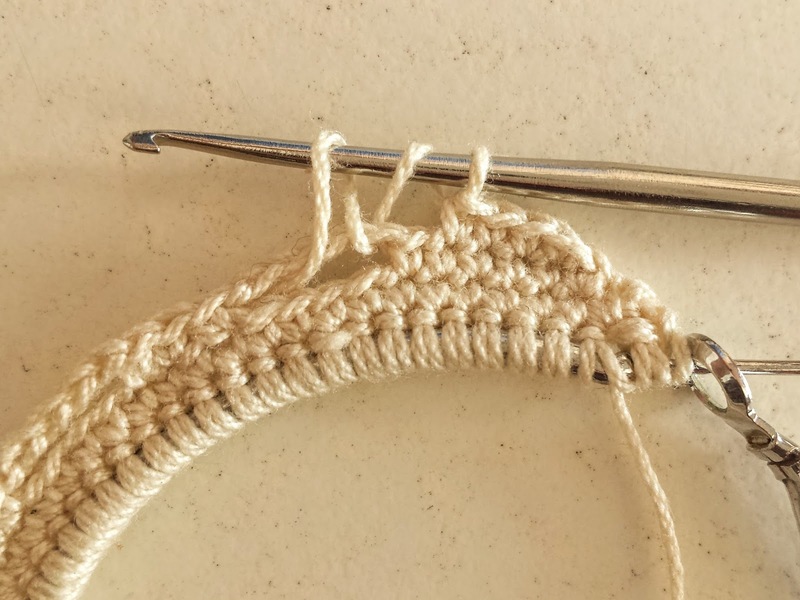 Continue with another scallop stitch in the next loop out of 10 double crochet stitches followed by one single crochet stitch in the middle (skip one, single crochet, skip one). Continue until the end of the row then close. 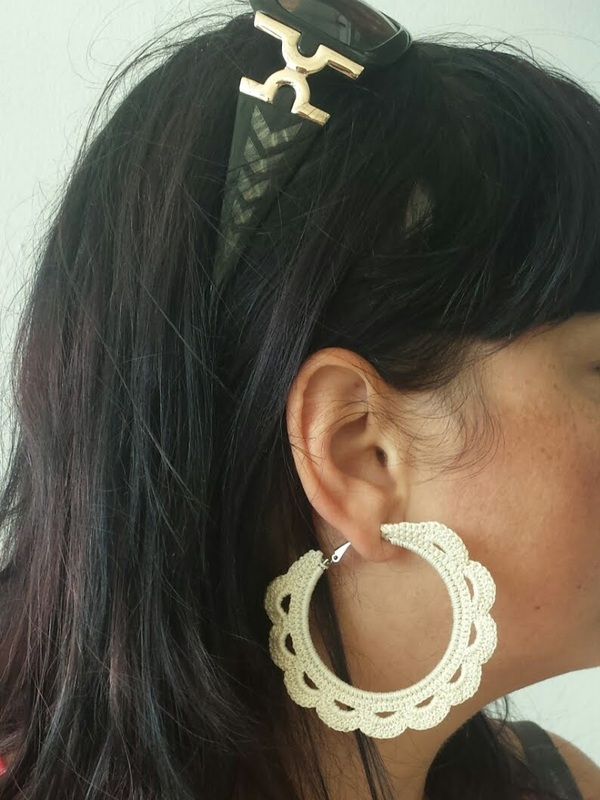 Weave in the ends and your first crochet earring is done. 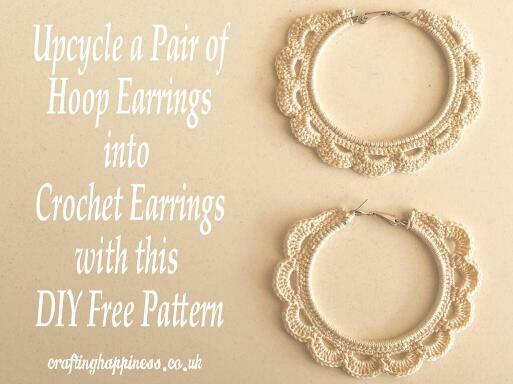 Follow the pattern to create the second earring. This is how mine look like. I hope you found my tutorial easy to follow, don't forget you can get the large print, ad-free, printable PDF pattern HERE and you can add it to your Ravelry queue HERE. I absolutely love this!! I'm definitely going to make these! Great job ! I love reading your diy posts, you’re so creative it’s unreal. I wish I had that talent but the last time I tried a diy project it looked like a 5 year old made it. Do you have any simple diy projects for someone that’s not as crafty? 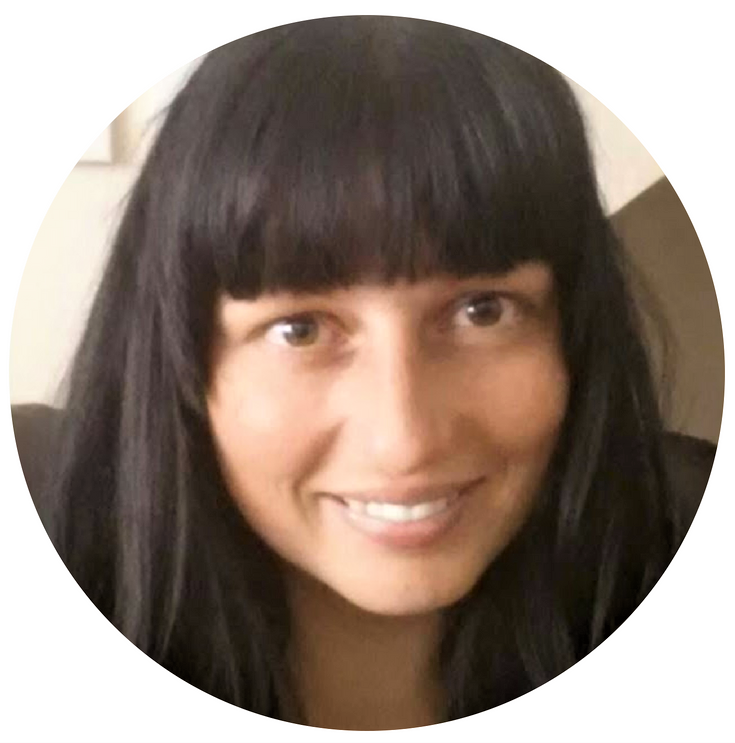 Hi, a lot of our projects are for beginners, I add new ones all the time so keep an eye on the blog. I would recommend starting with the granny square blanket, it's easy and fun to make if you like crocheting.